Verse is a network standard that a allows graphics applications to share data in real-time. It means that two or more independent applications can share the same data. If you make a change in one you immediately see the change in the other. It is a free and open source system that can be integrated in to any graphics application to allow them to share data. You can collaborate with other users over the Internet, use it for content pipe-lining, games, VR, simulation and much much more. Blender and Loq Airou connected together using a verse server. On this site you can find many applications that use verse like the high quality rendering engine "Quel Solaar", the schematic verse editor "Co On" and the modeling tool "Loq Airou"
I am always hard to chose what application to use, all applications have pros and cons. But with verse you can connect all applications you want to work on the same data at once. You may run 3D Studio MAX on the same machine as you are running Blender and have the scene be shared by the two applications. If you make a change in one of them you see the change in real time in the other, its just like the two apps are one only with two windows. for instance you can run a 2D paint tool and see how the texture updates in your 3d program in real time. No Importing, no exporting no re load it all just happens. If you are not happy with a tool you can easily swap it out for an other. If you have a large team of artists they can now work on large scenes together, one may be modeling while someone else is texturing, and at any time you can see the other users changes in real time. You can even do it over the Internet so that the team can be spread out. Since all artists have different tasks and preferences they can all use different tools, so there is no need for a office wide tool standard, making it easier to switch and improve the tool set, and hire new people who can come in with out learning new tools. If you are a developer and you write a application that connects to verse you know its going to work with any other application that also uses verse. Since the tools can interact in real-time like if they where one big tool, you can write smaller modules rater then big bloated apps. It is easy to have large teams developing for verse because you can split it up in different tasks that only communicate using verse. Since verse is documented standard you applications will work together with the creations of other developers who you don't even need to know about to collaborate with. Or try one of the many other applications available. If you are a developer look in to how you can develop verse applications or adopt your existing tools to make use of verse. There is extensive documentation on the official web page including "How-to"s, sample code, and the verse spec. If you need any help or have questions mail us or join the verse mailing list or IRC channel #verse at freenode.net. 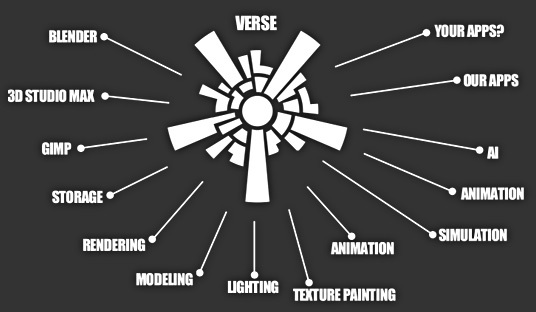 What verse needs the most right now is for you to spread the word about verse and try to get the developers of your favorite software to support verse. If verse is a feature enough customer wants they will implement it. So tell your software vendor about it.